Get Kate’s New Book, Leading Morale, to Stop Negativity & Ignite Contributions! Morale is all about daily dignity that inspires, engages, and builds trust. Morale is not an event. It’s not touchy-feely cheer-leading fluff. For high performance and results, lead morale by honoring employees’ dignity, engaging their ideas, building their trust, and appreciating their contributions. Retain valuable employees with a workplace of great morale. Fuel high performance by stopping chronic negativity and complaining. Lead morale right from the start so you won’t have to fix it later! Leading Morale is a first-rate resource for executives, business owners, leaders, managers, project leaders, team leaders, supervisors, and of course, aspiring leaders. The research findings, case studies, action steps, checklists, do’s and don’ts, and humorous illustrations will have you leading morale with ease. 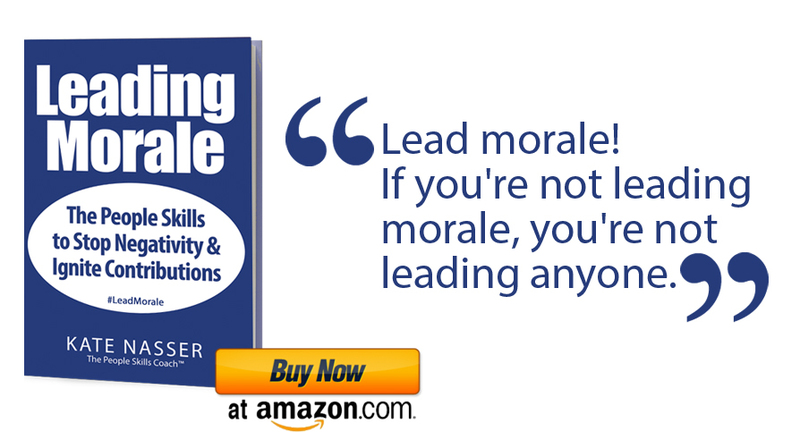 Read Leading Morale right now because if you’re not leading morale, you’re not leading anyone! Kate Nasser, The People Skills Coach™, delivers keynotes, workshops, and coaching, leading morale, leading change, employee engagement, teamwork, and delivering the ultimate customer service. She turns interaction obstacles into interpersonal success. See this site for workshop outlines, keynote footage, and customer results.